Trust God through it. Often times when tough things come our direction we lose hope. We start doubting our ability to make it out. 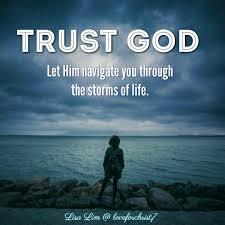 But we must remember with God all things are possible and He will prevail in our lives if just surrender and trust Him through whatever it is. So never give up on God because He’s never given up on you and He never will. So keep praising Him and trusting in Him and believing that He is going to get you through. Regardless of what it is, never lose your faith and continue to always look to God for your direction. He will lead you and guide to through any trial that you may be experiencing in your life. Take care, stay encouraged and God bless you. Here are some scriptures for trusting God. Encouragers, Please click and listen to my Podcast “How to smile despite your trial” Click below and enjoy..
Here’s the song of the week. “I Believe” Click and enjoy..